When was your last pap smear and mammogram? Women screened through the program and diagnosed with breast or cervical cancer receive treatment. For more information, please call the Florida Breast and Cervical Cancer Early Detection Screen Program at the Florida Department of Health at 800-226-6110. View or download an application. Women need their first pap test at the age of 21 regardless of sexual activity. Women need a pap test every three to five years after the first test as long as the test results continue to be normal. Women 20 years and over should have their breasts checked once a year by a health care professional. 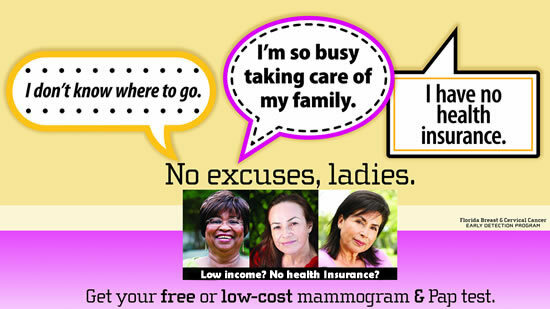 Women over age 40 should have a mammogram once a year. The Florida Breast and Cervical Cancer Early Detection Program (BCCEDP) makes it easy to get the breast and cervical cancer screenings doctors recommend. Funded by the Centers for Disease Control and Prevention (CDC), the FBCCEDP was created in response to the Breast and Cervical Cancer Mortality Act of 1990; Public Law 101-354. The program has been awarded funding by the CDC since 1994. The grant is administered through the central office and 16 lead County Health Department (CHD) regional coordinators manage service provision in the counties across the state to assure statewide access.